Ever since I started watching Korean dramas a while back, I was always interested in trying out a Korean-style spa. Focused on detoxification, Korean spas are community-oriented self-service facilities where you can lounge in various pools and treatment stations. When my friends first told me about Wi Spa, I knew I had to go! I’d been dreaming of trying out a new kind of spa, so we set course for Los Angeles and spent an entire day at this peaceful retreat. At Wi Spa, you pay for general admission to the spa and are given a watch to unlock your locker and a spa uniform that you must wear in the co-ed areas. The women and men’s areas are segregated on two different floors, and it is required that you must shower before entering the pools. Both the women and men’s areas have several pools from heated to cold, a shower facility and also seated showers as well. In these areas, you are not allowed to wear any clothes or swimwear in the pools, so don’t plan on bringing your bikini. At first, I admit this felt a bit new to me walking around completely naked, so I wrapped myself in my towel like the other women who felt the same. For those new to the Korean spa culture, you can consult Wi Spa’s Etiquette page to find answers to your questions. Forget the swimsuit. Towels, toothbrushes and shower gel are provided for you, although you may need to bring a loofah to actually use this. Shampoo and conditioner were not provided, so you may want to bring those. Don’t forget your heat styling tools, make-up and extra clothes if you intend to go out to dinner afterward! I also brought flip flops to wear around the women’s pools, showers and bathroom areas just because I don’t like walking around barefoot in common areas. The Jimjilbang is a co-ed area that marks the heart of the common areas. Donning the Wi Spa shirts and shorts you are given, you are welcome to lay a mat down on the heated floors and take a nap, read a book, or even bring your laptop and enjoy the wi-fi. Inside the Jimjilbang there are several sauna rooms, each unique with its own different type of healing minerals. Salt Sauna: Filled with minerals such as calcium, magnesium, iron, sodium, and selenium, the dry and warm salt-infused air helps reduce inflammation, improve your mood and reduce respiratory ailments. Clay Sauna: Clay is a naturally-occurring, negatively-charged substance that is capable of pulling out positively-charged toxins in the body. Jade Room: The jade built into the walls is said to aid in brain function and also helps to balance hormones in women. Bulgama: This Wooden room is heated at 190 degrees and is meant for thermotherapy. Sit in here for a good 5 minutes to break a sweat and help encourage your body to purge toxins. Ice Sauna: The cool-off step in your spa regimen, the ice room helps to constrict blood vessels and stimulate the skin cells. Located on the same floor as the Jimjilbang, Wi Spa’s restaurant offers plenty of delicious Korean dishes, from bulgogi to bibimbap. They also provide several healthy options like salads, shaved ice with fruit, and smoothies. 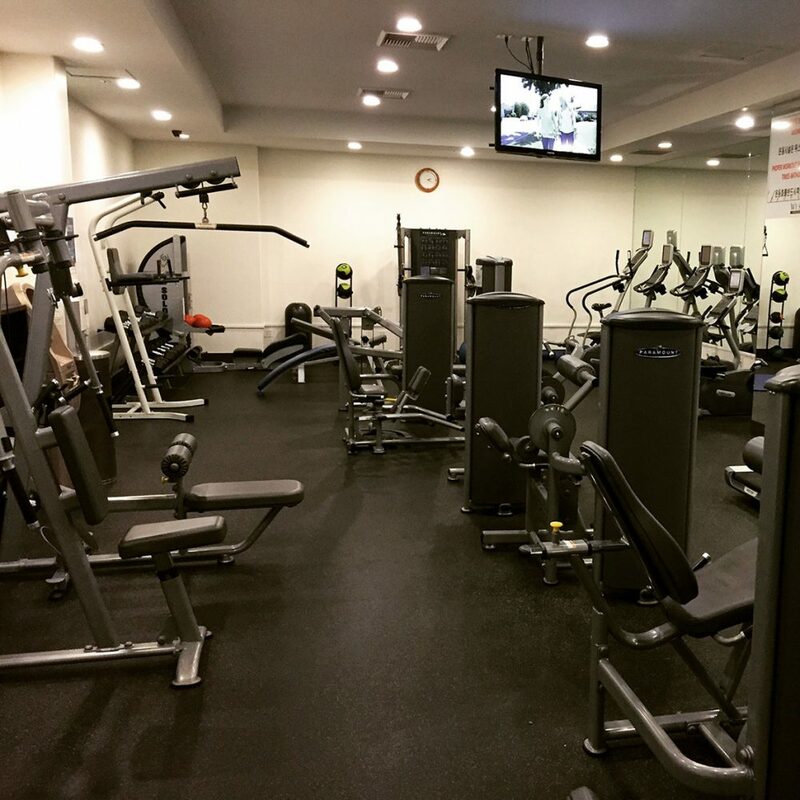 Included with your general admission, one of the many amenities you have access to is their full-service gym. Wi Spa’s gym has a full set of various weight lifting machines and cardio equipment such as treadmills, ellipticals and bikes. Shirts, shorts and water are provided, although you still have to bring your own gym shoes. Although Wi Spa is open 24 hours, their gym is open from only 5AM-11PM. Recently remodeled, the rooftop is a beautiful place to lounge and take a nap or watch TV. It is a gorgeous place to hang out with your friends at night! The Jimjilbang has an area for kids to hang out and play, making Wi Spa a family-friendly spot. Beware of the weekends, as it can get packed and can almost feel like Disneyland at times. The separate men and women’s facilities have retail shops where you can purchase a variety of other beauty items such as shampoos, brushes, nail polish and much more. Feel free to get a sheet mask and bring it with you to the jimjilbang to use. Also available at Wi Spa is a wide variety of reasonably-priced spa treatments and services, available by appointment. I personally tried the body scrub and massage and loved it! The scrub was a bit abrasive and may be rough for newcomers to the Korean spa world, but these scrubs definitely slough off loads of dead skin, leaving you baby-soft afterward. On select days of the week, scheduling a spa treatment will waive your admission fee. General admission to the jimjilbang and sauna is only $25 per person, which is an extremely great deal given all of the amenities you have access to. If you check-in between 12 midnight – 4AM, admission is $35 instead. If you enter during the day at the $25 rate and stay past 4AM, you are charged a $10 overnight fee ($35 total). For every day of the week, Wi Spa offers plenty of opportunities to save money on admission or services. Click here to view their current specials. Wi Spa also offers complimentary valet parking for all customers on their own private lot. 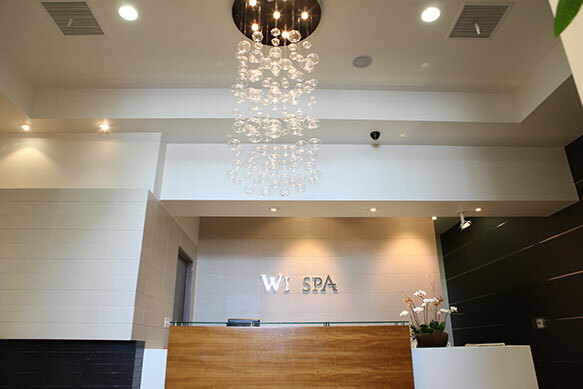 For more information on Wi Spa, please visit their website. Liked this post? Subscribe to my newsletter below for my spa and travel posts delivered straight to your email.